We sadly note the passing, at age 86, of John Frater of Masterton, Wairarapa, New Zealand. John was the originator of the Taratahi line of dahlias. He also won prizes as a bagpiper and was a respected pipe major with his local band. John opened numerous dahlia shows by leading a procession with his bagpipes down the streets to the venue. 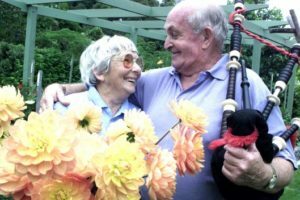 John and Edna, his wife for 65 years, loved their dahlias and grew beautiful seedlings. Unfortunately, only Taratari Lilac, Taratari Ruby, and Taratari Glo gained popularity in North America. There are numerous other beautiful Taratahi brand dahlias. John was an ADS member for more than 20 years. He was a senior dahlia judge and twice president of the National Dahlia Society of New Zealand. John’s wife Edna, daughters Chris Hawker, Jean (Thomas Carn), and Erin (Paul Swanson), seven grandchildren, and five great grandchildren have a wonderful legacy to bring them fond memories of special times.